Involving the next generation in making a difference in their own communities today. 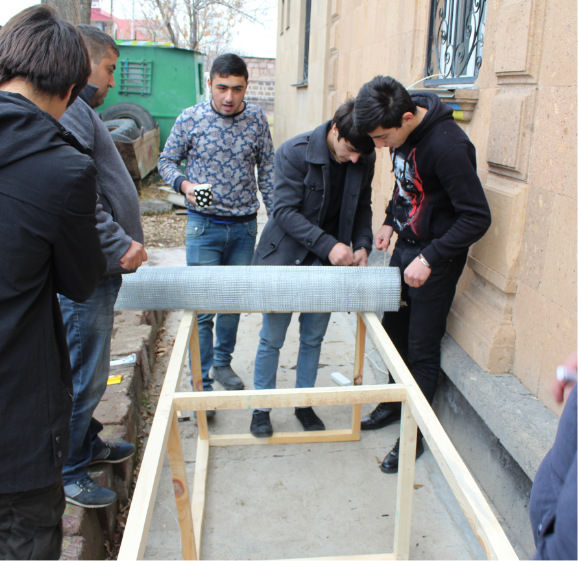 Eco-Clubs put ATP's environmental education into action by creating opportunities to contribute directly to local schools, families, communities, Armenia and the globe. These programs strengthen the environmental spirit of our youth while using leadership and teambuilding skills. participants witness first-hand how their actions help make an immediate, positive impact on their world today. Lessons for Eco-Clubs are fun, engaging and are based on active learning and build off of ATP's educational programs. Eco-Club participants make a positive impact on their overall life and behavior, as well as the lives of their families. Converting wooden pallets into composters and benches for community and home use. Building small green houses and cold frames to grow local vegetables. Repurposing old tires to create Christmas decorations for the village squares and comfortable tables and chairs for homes. Creating candles and decorations out of recycled materials that are sold or given as gifts. Initiating other community environmentally-friendly projects, including environmentally green bus-and-bicycle stops, greening school environments. Contact us at info@armeniatree.org to learn more about how to bring Eco-Clubs to your community.